A great deal of noise is currently being generated about development issues, piggy-backing on the 10th anniversary of the Millennium Declaration and targeting the Millennium Development Goals (MDGs) Summit in mid-September, which will be attended by Nick Clegg. Special interest groups of all kinds are taking this opportunity to push their message. The MDGs have been used for the past decade as a tool for guiding and measuring development progress. Not only has progress been found wanting: the MDGs themselves are wanting. They represent the wrong view of change; they are being routinely misused in a way which confuses the ends with the means; they are highly unrealistic; and they are set at a global level, when development happens much more locally. Because of these flaws, they act as perverse incentives, even obstructing the development process they are supposed to galvanise. The problem is not just the MDGs, but the ill-adapted development discourse that they represent. This prevailing development discourse tends to pull analysis, policy and action away from the political, institutional and societal towards the technical. This is partly because technical issues are simpler and less contentious. But it is also because the idea of ‘development’ – which is after all an intellectual and political construct – has become hugely confused. The mix of different ideas about human progress is dynamic, constantly being added to, and there are limits to the amount that can be added to a construct of this nature before it breaks down under its own weight. The development construct is now cracking under the weight of issues such as governance, human rights, gender, livelihoods, poverty eradication, poverty reduction, exclusion, international trade, human security, conflict-sensitivity, peacebuilding, climate adaptation, fragility, statebuilding, etc. (And this is before geo-political issues like anti-terrorism and access to rare earth minerals are added to increase complexity still further.) Because the development discourse accommodates them poorly, these complex ideas of human progress become distorted and mixed up together incoherently. A combination of politics and institutional constraints has turned this into an oversimplified development paradigm, as represented by the MDGs, which are a poor map with which to navigate, much less catalyse, the processes that constitute human progress. This matters enormously, because of the vast scale of human underdevelopment, and especially in so-called ‘fragile’ contexts, which are most resistant to progressive change and which are or risk being affected by violent conflict. It is therefore tremendously important to review and update our understanding of the way human progress happens. Politically, now is the right time to do this, because a growing public scepticism at a time of economic belt-tightening is raising well-founded questions about the impact of development aid, and these need convincing answers if public support is not to leach away. Meanwhile, other changes taking place in the world make this process overdue: the global power dynamic is shifting; there are a growing number of incomplete peace processes with the challenges they bring; development itself produces additional stresses in fragile contexts; and meanwhile climate change is generating another layer of stresses, to which people will have to adapt. We suggest three broad areas for action around the need to a) reframe the development discourse; b) create a new narrative to replace the MDGs; and c) make development institutions more fit for their purpose. There is no lack of creative thinking in the development sector. Plenty of ideas are being proposed and tested, and the sector is constantly alive with discussions about better ways to work. The problem is that for institutional reasons such ideas tend to be pushed to the margins. We need to harness these ideas and discussions better in order to improve our understanding of human progress, and enable more appropriate policies and actions to be developed and put into practice. This means we need a sustained, open and honest discussion about human progress and the role of development institutions. Many people working in development are sceptical about the prevailing development paradigm, but self-censor their views and ideas because the room for change seems limited. Such people need to be encouraged and empowered to be more forthcoming. There are numerous opportunities for this at every level, in the development of policies, strategies, and international agreements. These processes include the High Level Summit in September 2010, the High Level Forum on Aid Effectiveness in Seoul in 2011; the International Network on Conflict and Fragility managed by the Organisation for Economic Co-operation and Development (OECD); and the International Dialogue on Peacebuilding and Statebuilding. Meanwhile the EU is in the process of reconfiguring its external relations architecture. The new External Action Service will play a role in the EU’s overseas development assistance, and discussions about this should be informed by new thinking about human progress rather than simply adopting the paradigms on which the EC has based its overseas development in the past. Meanwhile, new development policies and strategies are constantly being prepared in developing and donor countries, in partnerships between them, and in multilateral organisations. All such processes provide opportunities for a fresh look at what constitutes development, and how it happens. At the MDG Summit in September, the main question being asked is ‘How can we achieve the MDGs by 2015?’ It would be impossible to change this now. But the Summit can nevertheless be used as an opportunity to begin changing the nature of the debate, for example, by establishing a process to identify what will replace the MDGs in 2015. The terms of reference for this process can be framed in a way which allows the conversation to question the MDGs themselves, rather than simply why they will not have been met. If this is matched at other levels of planning and review – in the development of new donor strategies for example, and in the political debate in ‘fragile’ countries themselves – the nature of the discourse will start to change, and an informal dialogue will be created which will contribute to a much richer narrative about human progress. The discussion needs to incorporate a mixture of perspectives from rich and poorer countries, different political cultures, established and emerging powers, governmental and non-governmental backgrounds, big business and small business, different civil society groupings, diverse geographic and cultural perspectives, different gender and age groups, the media, and academics from different disciplines such as economics, history, anthropology, and the arts. The media and politicians have a particularly important role to play, as it is they who ultimately set the terms of the public discourse within which aid and development institutions are guided and held accountable. They can help move the public debate away from the traditionally binary discussion about the pros and cons of aid, if they are willing to examine the complexity and nuances of the issue, what works and what does not work, and find new ways of conveying these to the general public. Ultimately, if the terms of the development discourse are to be renewed as we believe necessary, it will be because the many people working within the sector who know that the current paradigm is inadequate, take the initiative within their sphere of influence to alter the nature of the debate, and together create a kind of movement for change. As part of the changing discourse, we need to create a new narrative of development – of human progress – and a new global framework to replace the MDGs when they expire in 2015. This will tell the story of how human societies have developed, are developing and can develop further in the future. To avoid repeating the problems associated with the MDGs, it is important that this narrative achieves a better balance between political expediency and analytical rigour. The first step must be to create an analytically rigorous model. Once this is established, it can be used as the basis for a more political framework, but there should be no confusion between the two. This new framework can then be used by governments, NGOs, intergovernmental bodies and others, in line with the OECD’s exhortation to take the context as the starting point, to inspire local, national, regional and where appropriate, global goals and measures of progress. In our recent report, we suggested a model or framework for this new narrative, based on a vision of a world in which people can resolve their differences without violence, while continuing to make equitable social and economic progress, and without lessening the opportunities for their neighbours or future generations to do the same. 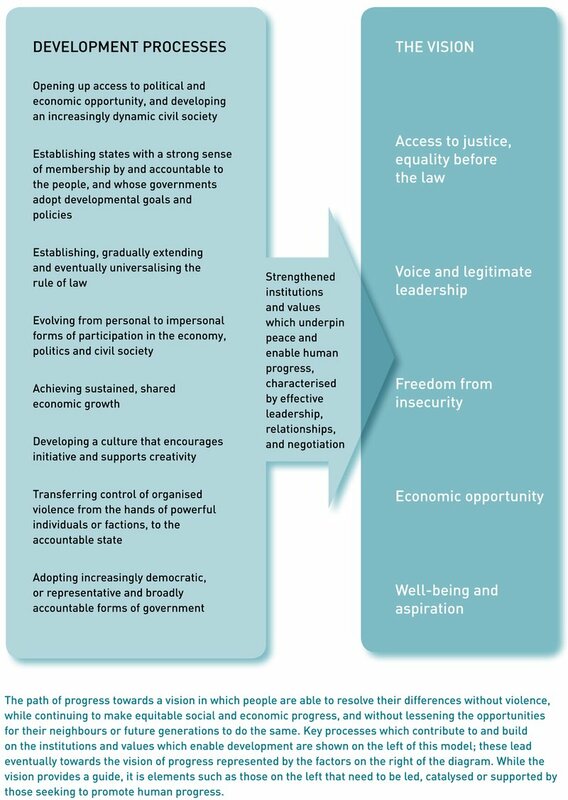 This vision would be both enabled and recognisable by five core factors: equal access to justice, political voice, security, economic opportunity and well-being. These would in their turn be underpinned by a self-reinforcing set of values and institutions. We suggest how societies have in the past made the transition towards this vision, giving clues as to how others may do so, and how such processes can be catalysed and helped. Be vision-based, i.e. contain a comprehensive idea of what developed societies look like. Describe how societies have transformed and can transform – i.e., make progress towards the vision. Explain the role of values and institutions in the process of change and in the vision itself. Be true to the idea of enabling change as contained in the UN Millennium Declaration: i.e. ‘promote and create global and national environments conducive to development and to the eradication of poverty’. This is in recognition that development is a mainly endogenous process of change happening at multiple inter-related levels within society, requiring leadership and effective relationships and negotiation; and one that can be influenced, but not wrought, by external forces and an external enabling environment. Acknowledge the fundamental importance of subsidiarity, i.e. that decisions and actions are taken at the lowest appropriate level, within a framework which is set at the highest appropriate level; i.e. be expected to take context as the starting point. Make clear the difference between the vision, and the means or strategies needed to get there. This means, for example, disentangling humanitarian from development outcomes and processes – i.e. make clear the difference between humanitarian outcomes such as providing basic services to people in fragile contexts, and true development milestones that are the markers of progress towards the vision. Recognise the complexities and nuanced nature of development, and find ways to communicate these publicly as simply as possible. This new framework needs to be substantially completed by 2014, in time to replace the MDGs. The question before us should be: What kinds of institutions are needed in order to catalyse key processes such as state- and nation-building, opening access to political and economic opportunity, the impersonalisation of the political economy, sustained economic growth, democratisation, the establishment of the rule of law, and the evolution of a culture which encourages initiative? The tricky thing about this kind of work is that development institutions have to work within the political economy which they are keen to see transformed, and therefore to borrow a metaphor from woodwork, they have to “work with the grain, to change the grain” – a very tall order which above all requires analytical and political expertise. Establish a clear purpose for which these institutions are held transparently accountable. Broadly, there is a choice to be made here: the institutions can either provide a kind of welfare assistance in support of economic and social sector programmes, or they can aim to support development based on a more complex vision of human progress such as we have explored in this paper. These two options are very different in nature and thus require very different institutions for effective delivery. If the latter option is chosen, it should be coherent with the improved development narrative called for. Institutions need to know their limits and focus on nudging, stimulating and incentivising changes, within a strategic, big picture view of transformation. Ensure that they are organised, resourced and staffed in line with the agreed purpose, and that internal reward and accountability systems are designed accordingly, e.g. to encourage and reward creativity. This is likely to mean that they adopt the concept of subsidiarity themselves, with more decisions being taken closer to the ground and for some institutions, less reliance on “missions” from headquarters. It will mean forming new kinds of relationships with governments, civil society and others, and will require staff with the right kind of skills for such roles – people who can work with the grain to change the grain. This kind of work is not only labour-intensive, it is expert labour-intensive. It requires an institutional culture which is transparent and self-critical, and invites criticism from elsewhere. Be able to work with the grain to change the grain. This means working in new ways, for example to engage politically and on complex societal issues including exclusion, trust, culture and nation-building; to understand the operation of complex processes; to understand the operation of complex and competing incentives on people’s decisions and behaviour; to strengthen values and institutions (“the rules of the game”) in line with the long-term vision and promote leadership, improved relationships and opportunities for the negotiation of changed roles. And it needs to be able to harness the transforming progressive potential of the growing middle class in poor countries. In fragile contexts where the transformation needed for people to make genuine progress can be supported and stimulated. Look beyond “aid”, and especially at other international institutions whose actions have an impact on the enabling global environment, such as trade, and the regulation of international businesses operating in fragile environments. Devise strategies that are analytically sound, and are rooted in an analysis of the political economy. This entails figuring out how incentives can be rebalanced to promote change, and is likely to imply a more subtle and sharper use of aid conditionality as well as more donor funding through nongovernmental vehicles. While external agencies may lack leverage on the big political issues in fragile contexts, they can use their limited powers to incentivise small changes with big potential impacts. Take a long-term perspective, maintaining a balance between predictability and flexibility: predictability, so that partners and others can plan accordingly; flexibility, to be able to react and respond as the situation changes and understanding improves, in line with a concept of conflict-sensitivity. We recognise the enormity of the challenge we have proposed. But we make this challenge as realists not idealists. In a rapidly changing world, the development institutions – whose fundamental mandate is to help shape the changes – must continue to evolve, or they risk becoming irrelevant.